GOLD Coast's worst fears have been confirmed, with key position player Sam Day ruled out for the season after dislocating his hip on Sunday. Day suffered the horrific injury in the opening quarter of the JLT Community Series win over the Brisbane Lions and successfully underwent surgery on Monday evening. 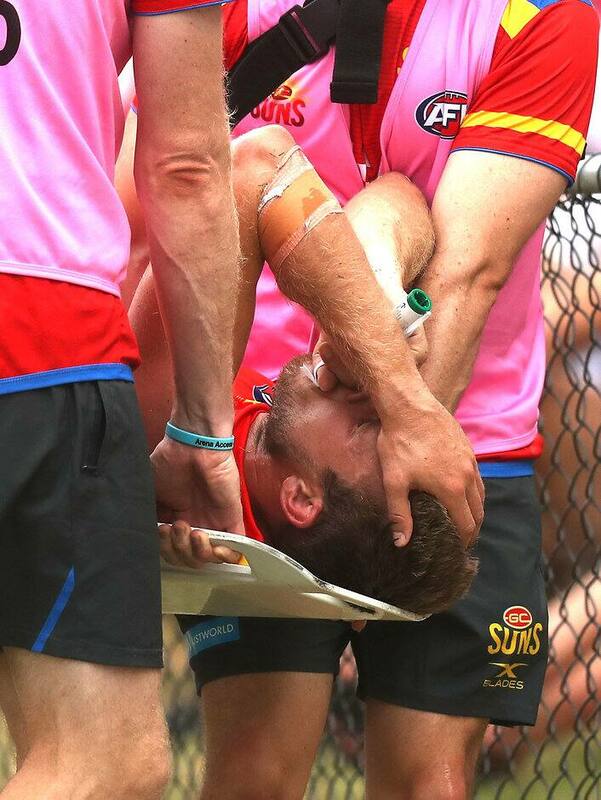 Gold Coast's football manager Marcus Ashcroft told the club's website there was a lot of bone damage and ligament damage around the joint. "He’s now in rehab and will miss the whole year," Ashcroft said. "So we're more concerned with getting him into a rehab program the next bit of time. That'll be non-weight bearing until six weeks." Meanwhile, ruckman Jarrod Witts split the webbing in his hand and is expected to be back for the club's final pre-season match against the Western Bulldogs on Thursday, March 9. Witts suffered the same injury while playing for Collingwood last season, with a subsequent infection costing him five weeks on the sidelines. "The worry last year is that it got infected and he missed a long period of time," Ashcroft said. "We wanted to make sure that didn’t happen this time around so we took the conservative option. "(We) put him into hospital for day surgery, got it cleaned out to make sure there’s no risk of infection. It was stitched up and he’ll be available to play in our JLT3 game." Jack Martin was a late withdrawal from Sunday's match with back tightness but will take his place against Essendon in Mackay on Sunday, as will Alex Sexton and Peter Wright.